Today I'm sharing a wedding vendor recommendation for all my brides. Christine Greenberg is the owner of Urban Set Bride, the most ADORABLE bridal shop I've ever been into. But more than being adorable, her store really caters to the individuality and personal experience of every bride. Christine is completely down to earth and awesome. I know that the brides who enjoy working with me would also enjoy working with her! And BONUS, she is also the head of Wood Grain & Lace Events, so she can do double duty as your event planner as well. Talk about a knowledgeable resource. 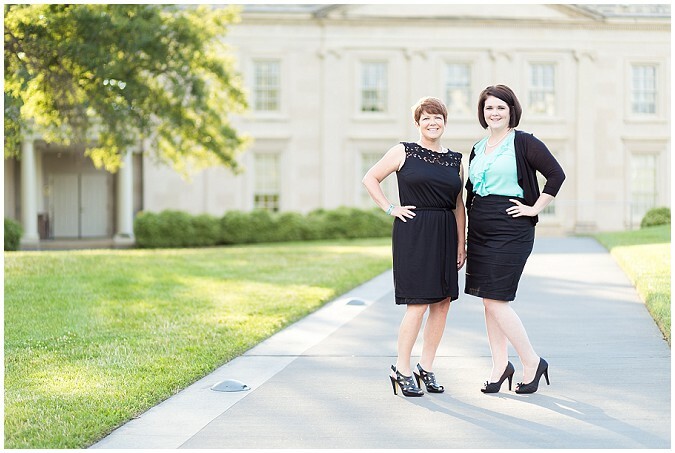 I met Nicole from Little Blue Box Events at Ashley and Brian's wedding back in May. I arrived early to scout out some pretty portrait locations and when I got there, Nicole and her mom, Deborah, were flying around the venue getting everything all set up and perfect. They were a total whirlwind of efficiency! Later, when everyone else had arrived, Nicole was constantly popping in, popping out. Checking in and then giving space. I think that's a tricky thing for a coordinator, to find the balance of being helpful without being overbearing. Nicole and her mom are so sweet and fun, that I think they just do this naturally. But it was when we did Ashley's portraits that I knew this was an A+ wedding vendor. Nicole sees things in DETAIL. Sometimes I don't and when I'm editing photos I'll say things like "ah why didn't I move that trash can in the background!?" or "I should have fluffed her dress out a little more." Nicole was there for all those things! She saw them when I was busy looking for light and the perfect expression on Ashley's face. It was so awesome to have her helping and I can honestly say I've never witnessed another coordinator take such good care of her bride on the day of the wedding. Since then, we've enjoyed chatting and getting to know each other better. I even had the privilege of shooting some new headshots for Nicole and her mom, who assists Nicole one the wedding day. I asked Nicole if she would answer some questions so that all my future brides could get to know her a little better. Here is what she had to say! How did you get started as a wedding and event coordinator? By sheer serendipity! In college, I was in Army ROTC and majored in Public Relations. The only wedding on my mind at the time was my own. But, when my best friend became engaged in 2009 I took over most of the planning for her wedding while she was in nursing school. I fell in love with the process! I was able to use my organization skills, my creativity and my business savvy to help her plan the wedding of her dreams. I received a lot of encouragement from friends, family and other industry professionals to go into business. I took every opportunity to educate myself and to network with some fantastic vendors. Little Blue Box Events was established in 2010, we just celebrated our four year anniversary! When my husband and I were planning our wedding my mother gave me a bracelet that said, “Friendship, Loyalty, Laughter, Love.” I live my life and run my business by those words. I am honored that I become friends with my clients; our connection doesn't end at midnight when they leave their wedding reception. I am loyal to my client first and foremost; my goal is to find them the best vendors and at the best price. Laughter, what is life without laughter? Especially, when things get stressful and chaotic… laugh and enjoy the ride! Those moments will become part of the story of your wedding and your marriage. My life is love. My love for my family and friends and my love for beautiful events. My business exists because of love! We always go above and beyond! We only book a handful of clients each year so that we are able to provide them with the quality attention they each deserve. We are not afraid to get our hands dirty to make sure our clients have as close to perfection as possible! If that means catching renegade birds, busing tables, last minute ironing or having that tissue handy for the groomsmen that said he wouldn't cry; we are on it! We pride ourselves on our customer service not only to the hosts of an event but to their guests. We want you and your guests to remember your event with pleasure and fond memories. It’s all in the details! Our ideal client is excited!! They are ready to make decisions and to let us guide them. We have spent countless hours educating ourselves and establishing a network of fantastic professionals. We want to share these resources with our clients. We love it when clients come to us with a concept and we are able to refine it and implement it together as a team. What is the benefit to hiring a professional event planner? Experience! A professional event planner will save you time, money and stress. If a full service planning package is out of your budget then I highly encourage a day-of coordinator. Your event will run smoothly. Details, those big and small, will be attended to and having a coordinator to act as the “go to person,” will ensure that you can enjoy your day. What would brides be surprised to know about you? I split my time between event coordination and working part time as an Emergency Communications Officer. It’s perfect because I truly thrive in high paced environments. Many aspects of event coordination transfer to dispatching; organization, communication and attention to detail. What would you like clients to know before hiring an event planner? Hire a planner that you wouldn't mind chatting with over a cup of coffee or a glass of wine because you will be spending a lot of time together. Check their references. Any event planner with experience will be able to provide you with multiple references from past clients. Don’t hesitate to contact those references and ask them questions (They probably won’t mind telling you all about their wedding day! ;) ). About a month ago, I had the privilege to meet Kim and her amazing staff and take some company headshots for them. I was browsing their website and saw that we were fellow JMU grads and I could just feel her personality coming through. I had to contact her and find out more. When I arrived at Kim's store (and yes, it's a store! full of adorable things) I had thought there would be Kim and maybe a few other girls who helped out. I was SO wrong. Kim Moody Design is a MACHINE, guys. Kim, her husband, and a team of friendly guys and gals are not only incredibly sweet and easy-going (exactly what you would want on your wedding day), but have an incredible network of resources that really make them a unique event planning company. I was truly amazed by how many services Kim offers to her brides and the unique DISCOUNTS that she can give them. I had always assumed a wedding planner would help the day go smoothly and make for a less stressful wedding planning experience, but it had never occurred to me that a wedding planner would actually be able to save me money. So cool! I've always been extremely creative and detail oriented, and, after graduating from the Interior Design program at James Madison University, I began subcontracting for architects and engineers and ran their job sites during the peak of the construction/remodeling boom from about 2004 to 2008. Prior to that I'd helped with a few weddings for friends and family and, in 2004, I planned the first one on my own. I continued to do one to three per year for paid clients for several years and then each year after that our wedding workload basically doubled! Luckily, when the bottom dropped out of the remodeling industry, our wedding business was just picking up pretty heavily. Our studio has been exclusively focused on weddings since 2008. We've expanded our offerings so much over the past decade it's hard to even remember the "early years" anymore, but we feel very blessed to have such an amazing team continue to provide our clients with unmatched service and design skill since 2004. We are as "hands on" as our clients wish for us to be! We work in collaboration with our couples to help plan and execute an incredible day for their families to enjoy! We prefer to at least be involved with all of the creative vision for our full planning clients and are very "client centered" in developing something more than what they dreamed of for their wedding day! We have an incredible relationship with the vendors in our industry areas across the state of Virginia and are delighted to work with all of our friends to create an impeccable finished product for our couples! We have a handful of things that make us different than any wedding planner in the state outside of Northern Virginia. The first is that Kim Moody Design operates with a huge TEAM of staff to create incredible events weekend after weekend. Most wedding planners work out of their guestroom as a home office with "interns" as their assistants on the day of someone's wedding. We are the opposite. We have a year-round, full-time staff of at least five planners and a HUGE support staff of part-time, well-trained event helpers. The second is that we own two commercial buildings which house our offices, design studio, warehouse storage, linen rentals, and floral studio. We are no small operation. The amount of things we can provide in-house for our clients is unmatched by any other planning team that we are aware of in the entire state. This translates to saving money for our clients as well as providing them with an ever-growing quantity of new looks for their big day! We can save them in rental costs, delivery fees, and setup costs by managing so much of it in-house! Hire a good one! There are so many phonies out there. Look for an incredible amount of experience because that will enable them to know how to give you the best level of crisis management possible. In fact, the more experienced the planner the less times per year they experience bumps in the road. You get what you pay for – choose the very best planner you can afford and they will most likely save you much more than the fees that they charge over the course of your event. Most importantly, make sure you feel comfortable with your planner; they are going to be with you throughout the most intimate moments of your big day. You should have a good working relationship, feel very comfortable together, and be able to have honest conversations with them throughout the process. Thanks so much for your informative responses, Kim! It was a pleasure getting to know you. Recently, I was lucky enough to get to know these lovely ladies at Designs by Janice, a florist located about five minutes from my house in Midlothian, VA! Janice was working on a new website and I offered to take some photos for her. I had a great time getting to know her and asked if she'd be willing to answer some questions for me for a new blog series I wanted to do featuring local wedding vendors. My hope is that I'll eventually have a great, unique resource for my brides who need help choosing wedding vendors. It's overwhelming to peruse website after website and sometimes you don't even know where the business is located and if it's feasible to hire them in the first place. Sometimes it's nice to have someone you already trust narrow things down a bit for you. How did you get started as a florist? I started working with the floral industry while in college at Richard Bland. I try to make all brides feel welcome and never step outside of their budget. Always trying to get the look for them that they want. I want them to feel comfortable when speaking with me. I feel we go above and beyond all of our brides expectations. It does not matter how many flowers we use, we add what we need to, in order to achieve the look they require. Our staff is wonderful with our brides, The mothers always feel comfortable in speaking with us! We build a relationship with them. They can call us anytime office or home. Our ideal client is a bride who says, make my designs from what I envision, do whatever you need to, you're the expert! What is the benefit to hiring a professional florist? Hiring a professional florist is a must, really, we are trained and have the experience we need to stay with all the new designs that are out there. A lot goes into your flowers not just designing, but the care once they are received. And the delivery to your site. With our florist the designer always delivers your product. Brides would be surprised to know that we will always come within a range close to their budget! And that how easy it is for us to take all the thought process and create your vision. Our ideas are never ending. Just give us your color dress...we'll do the rest!